FX is a healthy addiction. Sure, you might start out with a dash of drive, but pretty soon you’ll be chasing sounds your setup can’t deliver. If you just want another stopgap FX pedal, move along. 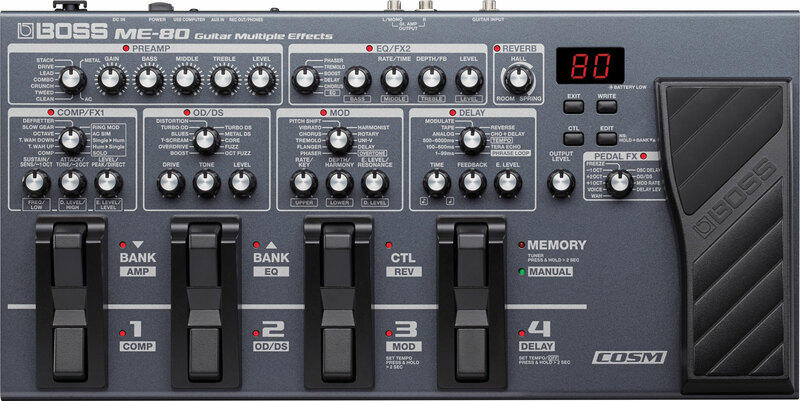 But if you want a keeper, invest in the new Boss ME-80. Raising the spec of the Boss ME-70, and taking key features from the flagship Boss GT-100, it’s as tone-packed as a top studio, but as easy to operate as a stompbox. Think of a box and the Boss ME-80 ticks it. Under the bonnet, an array of ultra-realistic COSM amp models replicate the coolest amps in history, and pro Boss effects are ready to give your songs wings. On the dashboard, a pedalboard-style layout of gig-friendly footswitches, intuitive controls and expression pedal let you bring the noise fast and shape it in real-time. Live guitarists will lap up the Boss ME-80, but so too will production boffins, thanks to free Boss Tone Studio software that allows deep editing on your computer, and gives a web connection to the gig-ready patches and endless guitar content at Boss Tone Central. There’s a new Boss in town.